Randy Strijek remained patient in April 1989, according to his hometown Schenectady Gazette. He'd made AA Hagerstown with the Orioles in his fourth season on the strength of his defense. He looked then to improve his hitting and maybe take that next step to AAA, according to The Gazette. "I played pretty good at short last year. I made the all-star team, and if I get a chance, it would be nice to get to Rochester," Strijek told The Gazette as Hagerstown visited Albany-Colonie. "Everybody needs a chance, you've got to get a break." Strijek's chance, though, never came. He played an abbreviated season that year and another short season the next. He never made it higher than AA. Strijek's career began in 1986, taken by the Orioles in the 17th round of the draft out of Western Kentucky University. Strijek went to Western Kentucky after graduating Draper High School in Rotterdam, NY, outside of Schenectady, and he stood out from a young age. He played on Rotterdam's 1980 Babe Ruth World Champion team. At Draper, Strijek won all-conference honors four times and won second-team All-America honors his senior year, according to The Gazette. He made his old school district's hall of fame in 2013. Strijek started with the Orioles at short-season Newark. He hit .209 in 72 games while playing shortstop for the team. He then returned to Newark for 1987, getting 66 games there. He also got 34 games at single-A Hagerstown. Between the two levels, he hit .229. Strijek played all of 1988 at Hagerstown, hitting .237 at short and making the Carolina League All-Star team. He moved up to AA as Hagerstown moved to that level, but he got into just 22 games there and on the season. 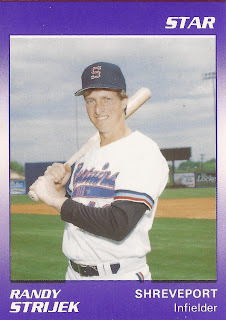 After moving to the Giants in a trade, Strijek played 1990 at AA Shreveport, but his stay there was also short-lived. He singled and scored in a June game, after giving up a run on an error. He ended with just 17 appearances, closing out his professional career.